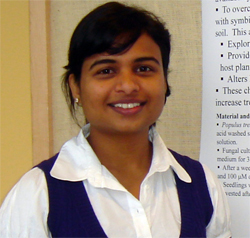 Shalaka Desai has been a postdoc in the Biosciences division for eight months. She received her graduate training in Biology at West Virginia University where she received training in plant biology, physiology and characterized the effect of a plant-fungal association — mycorrhizal symbioses — on phosphorus (P) limitation in poplar trees. She currently is part of a U.S. Department of Energy (DOE) funded program that examines how plant-microbe communities respond to changes in environmental conditions. Plant-microbe interactions are important for efficient use of nutrient resources, yet most research on plant C and nutrient capture and associated modeling efforts rely on data from study lacking symbionts. Mycorrhizal fungi form symbioses with more than 90 percent of plant families and bacteria are ubiquitous in the rhizosphere. Both groups of microbes increase nutrient acquisition and enhance C capture by the host plant. Her research supports the Genomic Sciences Program goal of achieving a genome-based, dynamic systems-level understanding of organism and community functions. As someone who is new to the laboratory, Postdoctoral Coordinator Tina Henne asked Shalaka to provide her perspective on the Argonne postdoctoral experience, how it compares to the university environment of graduate school and her initial impressions of mentoring at the laboratory. 1. Thus far, how has the postdoc experience been different than graduate school? Both have advantages and drawbacks. One advantage is less distraction due to graduate course requirements and other obligations, freeing up more time to focus on research. A postdoc no longer needs to worry about the graduating. [We can all appreciate that!] Argonne also offers the benefit of technical and high throughput facilities, in addition to access to so many experts at one place. This fosters scientific discussion and a greater chance for collaborating and writing proposals. One drawback is that you don’t have undergrad and honor students helping you, sometimes due to limitation of funds. You need to plan ahead for things like taking vacations or holiday and completing paper work. The paper work required for things like ordering research supplies is another challenge that postdocs face compared to graduate school. Because of the need to really stay focused, it may be harder to find friends like in grad school. 2. What type of mentorship have you received here? Assigned mentor through mentoring program? Informal with other researchers? I got to know Carol [Giometti] the first day I was at Argonne. I liked her work and was happy to meet someone with whom I could share the same research passion in proteomics. I am glad to have a very good Principal Investigator and based on my grad school experience where I got used to mentoring being a natural part of graduate education, I was not sure at first about the mentoring program at Argonne or how that would help me. But to my surprise it was very fruitful from the very first meeting I had with Carol. We decide to meet every other Monday and I would look forward to every meeting. Sometime I would make additional appointments. She helped to take the pressure of the expectation and obligation one feels in the first job or fresh out of school. She gave me career direction as well as personal counsel. It was refreshing to see that even though she was a division director, she was a very humble and honest person. 3. In what ways has your experience been enhanced/benefited from having a mentor? What have you learned? I have learned a lot from Carol, but still feel eight months is a short period and I have more to learn from her. It is nice to have a mentor, because you can go and talk openly about your career options without thinking about the person judging you and how this will affect your professional life. She taught me to strategically plan for my career and how to have a work-life balance. She also reminded me not to get worked-up and get things done in a more efficient manner. My future career goals became clearer. I know all this sounds like an idle situation, but when a person is working with you closely it make a huge difference. Since she had been through this career path and she knew exactly what was going through my mind. 4. Some people think that having a mentor somehow implies that your supervisor is not a mentor. Can you speak to that/dispel that myth? I disagree with that because I think both can be good mentors, but at the same time both are important to have. I have a very good experience and guidance from my PI. But then with the PI it is difficult to focus discussion on your career path without talking about the everyday lab problems. It can be more critical to discuss the long term goals of the research with your supervisor. 5. What are three pieces of advice you would give to in-coming postdocs about working at the Lab? Take advantage of the mentoring program to help figure out what is working for you in your career and how to go where you want in your career. It also helps to manage the stress and feel rewarded when you discuss the small achievements with the mentor. To have a mentor during a postdoc is a good transition from grad school where you have your mentor, committee members and other senior grad students helping and counseling you. The most important thing I learned from Carol was to have short term goals and long term career goals, not to rush for everything at once and get worked-up. 6. Any advice on how to get the most out of a mentoring relationship? Find a person you are comfortable talking with. Be open about your concerns and fears with them so they can help you. I think most important is also to trust them. This entry was posted in Mentoring and tagged mentoring, shalaka desai. Bookmark the permalink.